Last edited by AndyG on Sat Apr 14, 2018 12:38 pm, edited 3 times in total. that is not what any tercel strut I have ever seen has on it. not sure what that is, pershaps a replacement/aftermarket strut. all I have seen has the large cap nut that comes off, you dump the old strut parts out, and install the new insert. Yeah I thought this was going to go smooth like that but this has me scratching my head. 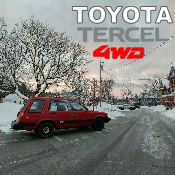 Weird thing is, it actually is for a Toyota Tercel wagon but it’s discontinued. It’s ingraved on the side of the housing “Toyota 48510-16690 kyb, Gas filled do not open”. I guess Toyota used to have non serviceable struts for these cars? Well, there is that wagon at the lynnwood pick n pull and one in Arlington. I guess I’ll check the lynnwood one out again and hopefully it’ll have the screwable strut housing. Nope, this is a KYB complete replacement strut assembly. They come with new bearing plate, springs and strut/insert assembly welded as a unit. @synthdesign Ooooh okay. I typed the part number on google, and it mostly came up as a discontinued part on a few sites I checked. Good news.. I scored on the right strut housings from the junkyard! She is lifted. 1 1/2 inch in the front, 3 in the rear. Now I just gotta throw my big tires on. I doubled up on the rear upper spring seats to had a little bit more height to it. I may cut out a 1/4inch spacer from a kitchen cutting board to lift the front a tad more. Just to make the ride height a bit more even. Last edited by AndyG on Sat Mar 31, 2018 10:02 am, edited 1 time in total. Did you mean Abra Cadabra??? @terceldude No. I know how to spell it correctly, but this is how the users name is spelled; the one who came up with this lift. What size tires and rims are you going to run? What brand and sizes? I’m trying to put 14” American racing wheels and 27” general grabber at2. Think those would fit? @T4WDgambler yup those will fit. I got them on now with basset steel wheels. Boy, it sure is a heavy setup for these under powered cars. The tire itself is 25lbs and it feels like the wheels are about the same weight. I had to cut out some plastic out in the wheelwells, and bend/pry/hammer away at some metal. Also pulled the fenders out a little more. Still occasional rubbing cranking the wheel or going over a large bump fast but for the most part I can drive. I’ll have to do some more prying/cutting. Where'd ya get those fender flares? those just look like the stock body flares, they are painted black to set them off. Looks very nice. so shinny too. I can not keep mine clean becasue I drive almost six miles of gravel roads daily (three out to the highway in the morning, three back home in the evening). so when I wash and wax it, clean and black out the tires and trim, clean it up, it looks good in the driveway...until I have to drive it for the first time. hard for me to stay motivaged to keep it clean and nice looking, looks dirty and muddy after just a day or two of driving on our own roads. even the inside picks up dust in the summer, or mud and gravel on the floor mats, very quickly. it seems a never ending task to keep it nice look out where I live. at this point however, I am just happy when it starts and runs well without issues everyday.